The biggest and baddest Mustang and Ford drag race of the year hits Beech Bend Raceway for the 21st annual Nitto Tire All-Ford World Finals and it is bringing 2,000hp Street Outlaws with them to battle it out on the famed drag strip. Get in where you fit in with 6 heads-up classes, 5 Index categories, Bracket Racing, QA1 True Street racing, King of the Street (new format! ), Car Show, Swap Meet, and Manufacturer's Midway. Don't miss the biggest, boldest, and quickest Ford drag race of the year. The 21st annual Nitto Tire All-Ford World Finals takes over Bowling Green, Kentucky over the weekend of September 26-29 2019. 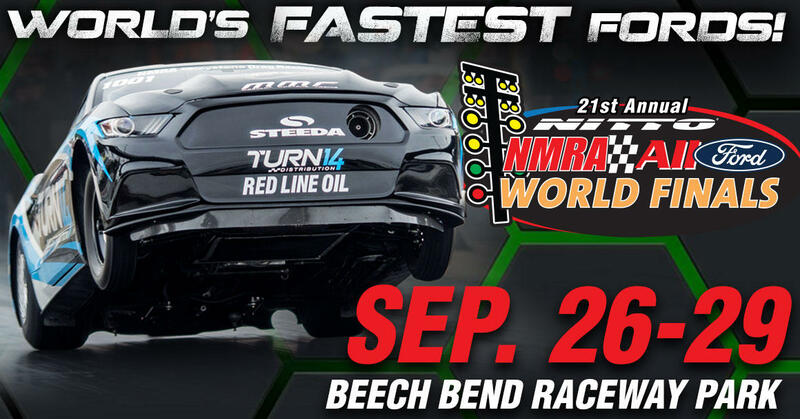 The town is painted blue as Beech Bend Raceway once again hosts a historic Ford drag racing event as NMRAs world famous racing categories chase championships and records. The final stop on a six-race tour of the USA dishes out the more power-per-Mustang than any other drag race. As championship battles are waged through the NMRA categories, specialty shootouts pull-in the hottest niche Mustang groups to let them showcase their stuff in front of thousands of fans in the near-capacity crowd. Since street racing is illegal, NMRA is open to any Ford vehicle with its True Street field competition. Join 150 other True Street cars as a 30-mile road tour brings the festival of power to the streets of Bowling Green in the biggest horsepower parade in the towns history. The day concludes with gear-bangin fun on the Beech Bend Raceway quarter-mile for three consecutive runs down the track. The 3-runs are averaged together to create an average, of which the rankings list the final order. Eight winners are crowned from 7-second street cars up to 15-second nearly-stock Ford vehicles. Buy a Mustang on Saturday morning and race it that afternoon in True Street or bring down your quick street car and see how it stacks up against some of the nations finest street-legal Mustangs. Stacked with championship street racing from the quickest Fords on small tires, watch the 2,000hp Street Outlaws and 1,500hp Edelbrock Renegade put it all on the line for the cash, the glory, and a chance to win a NMRA championship. It doesnt stop there as the quarter-mile warriors of Modified Street, Limited Street, Coyote Stock, and Factory Stock will put on a show you wont soon forget! Adding to the championship drama is the exciting Stick-Shift Shootout, Turbo Coyotes, and Much More. The largest all-Ford car show in Beech Bend Raceway history takes place Saturday and Sunday with over 100 show awards presented to the finest Blue Oval machines. If you are looking to talk to the biggest manufacturers of Ford and Mustang parts or hoping to save money, then look no further than the massive Manufacturers Midway, which is open Friday through Sunday.